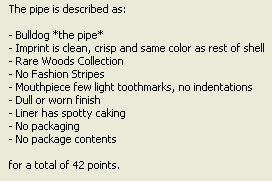 The value of pipe #771 is 42 points. Father Al Grosskopf came through again at the 2010 NASPC Show in Columbus, Ohio. This rare wood Bulldog will join my smoking group to await trading for one of the seven still needed for the collection. It will replace the one I inadvertently took apart by smoking it too hot and beginning to clean it before it cooled. Thomas Soudelier got this pipe in trade for a Maroon Apple that I have been searching for.